That all started with the Big Bang!" * The Big Bang Theory has renewed to season 12 and 11 Season will be available on DVD and Blu-ray in September 11th, 2018, while the latest news shows that season 12 is on its way out. 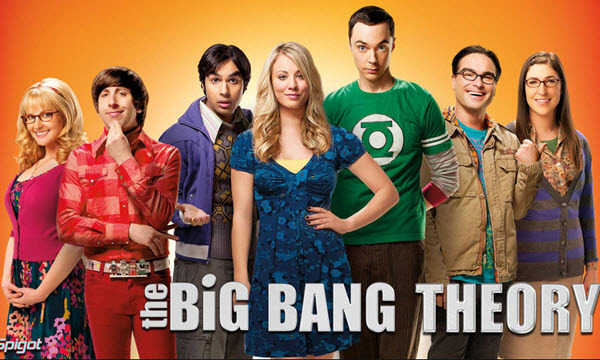 See how to free watch and download Big Bang Theory Season 1-12 full episodes! I guess we are all familiar with the words and tunes of this theme song for the most welcome sitcom The Big Bang Theory. Probably you may just catch some pieces of the music, but there must be a lot of funny scenes, especially scenes with harsh and blunt Sheldon Cooper, that come to your mind every time you think of this amusing The Big Bang Theory (DVD) TV show. Personally, what impresses me most is "Bazinga", one of Sheldon's classic quotes. And I also love those Big Bang Theory episodes, in which Penny has to sing "Soft kitty" to sick or homesick Sheldon to cheer him up. In a word, it is such a joy watching The Big Bang Theory. The Big Bang Theory DVD (season 1-11) has been available on Amazon. You can choose to buy either DVD of The Big Bang Theory episodes or its whole season, like The Big Bang Theory Seventh Season. Besides, there are two versions of The Big Bang Theory DVD, standard or HD. I have to say that such a well made and awesome show deserves your collection. The Big Bang Theory will never get old. But we spend all day with mobiles and tablets nowadays for their portability, which have no DVD drive. How can we enjoy HD The Big Bang Theory DVD on iPhone, iPad, Samsung Galaxy Note, HTC, or other gadgets? The answer is to rip DVD The Big Bang Theory to phones for playback. You may think that ripping The Big Bang Theory DVD is a way out but the answer is too general, and you need more, like what kind of tool is needed to do the Big Bang Theory DVD ripping job. Keep reading and we will get the Big Bang Theory DVD backup tool and process in more detail below. The first and best DVD ripper we recommend here for your The Big Bang Theory DVD ripping is WinX DVD Ripper Platinum, which ranks first for its ultra-fast DVD ripping speed and amazing high output quality. It is as easy as winking to rip your DVD The Big Bang Theory to iPhone XR/XS/X , iPad Air 2/mini 4/Pro, Samsung Galaxy S6/Note 5, HTC One M9, Google Nexus, Microsoft WP8, Surface etc. with this professional TV shows DVD ripper. And your intention of remaining original video/audio quality will be perfectly realized. You can batch covert The Big Bang Theory DVD full episodes, like season 11, to AVI, MP4, MPEG, WMV, AVC, etc for personal enjoyment on PC or gadgets, or sharing funny highlights on social media. Next is The Big Bang Theory DVD ripping steps (for your reference). Step 1: Insert DVD The Big Bang Theory, get the DVD ripper software started and click the button "DVD disc" on the main interface to load the DVD content. Note: The title list will be shown on the left. Select episodes of The Big Bang Theory you want to rip. If you are backing up a Disney DVD movie, like Frozen, or DreamWorks, Paramount, Warner movie DVD, WinX DVD Ripper Platinum can automatically detect the right title for you among up to 99 fake ones, and help you rip copy protected DVD movies. Step 2: Choose your desired output format. A variety of video formats and multiple presets are all available for you to choose. You can rip The Big Bang Theory DVD to MP4, DVD to AVI, DVD to MPEG and the like. Note: You are also free to set all video audio parameters, such as video resolution and bitrates. Whether to edit your Big Bang Theory video or not is totally up to you. You can add external subtitles, crop or merge video clips, remove unwanted borders and so on. Step 3: Select a destination folder, press button "Run" and the The Big Bang Theory DVD ripping starts. 2. Soft kitty, Warm kitty, Little ball of fur. Happy kitty, Sleepy kitty, Purr, purr, pur-r-r.
3. Knock, knock, knock, Penny! Knock, knock, knock, Penny! Knock, knock, knock, Penny! 4. I'm not crazy, my mother had me tested. 5. Hard as this may be to believe, it's possible that I'm not boyfriend material. Note: The software developer only advocates ripping DVDs The Big Bang Theory for personal use only and suggests referring to the DVD copyright laws in your countries before doing so. The Big Bang Theory - an American sitcom created by Chuck Lorre and Bill Prady, both of whom serve as executive producers on the show along with Steven Molaro. All three also serve as head writers. It premiered on CBS on September 24, 2007. The seventh season premiered on September 26, 2013.